Worldwide Lottery Games In Naturally Optimized Systems Pick 5 has been developed on the authors’ initiative, based on the belief that nothing in the Universe happens by chance because there are laws governing everything, and by increasing our knowledge, we can triumph over mere chance. This is a book for players and/or groups of players (syndicates) who want to play to more than seventy lottery games from at least fifty countries over five continents, as: MEGA MILLIONS (U.S.A., Multi-State), POWERBALL (U.S.A., Multi-State), EUROMILLIONS (Europe, Multi-Country), EUROJACKPOT (Europe, Multi-Country), SUPER LOTTO (China), SIKKIM THUNDERBALL (India), THUNDERBALL (U.K.), LOTO (France) SANS TOPU (Turkey), EL GORDO (Spain), GOSLOTO 5 iz 36 (Russia), MINI LOTO (Japan), QUINA (Brazil) and so on. 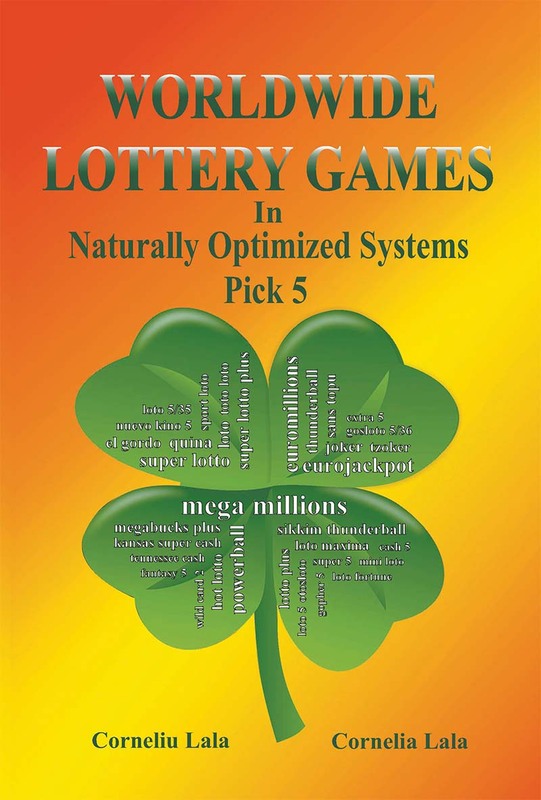 Worldwide Lottery Games In Naturally Optimized Systems Pick 5 contains 122 systems built with the help of original mathematical models. It is an original book comprising 51 simple variants systems, 38 pivoted variants systems and 33 combined variants systems for which the number of played numbers has values between 9 and 67 inclusive. Each system has its main characteristics, the winnings index and the unfolding on variants. The categories and the winnings will certainly be within the limits of one of the situations specified in the winnings index of the system used. All the playing systems selected in the present book are originally and naturally optimized, because the main parameters of the component combinatorial structures have optimal values. Therefore, 90 playing systems are at a level of absolute performance, which means with a smaller number of combinations, of the same category, it is not possible to get higher winnings indexes. The other 32 playing systems are at the highest level of current performance. More, all the playing systems are highly balanced. Experience in recent years has confirmed the value of the naturally optimized systems included in the book, through the numerous and substantial wins obtained by their help in many countries. Using the naturally optimized systems is a smart strategy for playing the lottery. FIVE ADVANTAGES OF NATURALLY OPTIMIZED SYSTEMS - Harmony with nature They are generated in harmony with nature, as they are based on the principles of balance, symmetry and proportion – fundamental principles of the creation, known everywhere in the world for thousands of years, which ensures their durability and high quality. - Optimum performance They are at a level of absolute performance, or at the highest level of current performance, as the main parameters of their combinatorial structures have optimum values. - Multi-system compatibility They are useful both to players and to groups of players worldwide, for lottery games of 5, 6 and 7 numbers in simple variant. - Guaranteed wins They help the lottery players to obtain guaranteed wins, strictly according to the previsions of the winnings indexes. - Accessibility They are easily accessible, can be understood by any player and their use does not require great effort, the action being made as simple as possible.